8-Station Turret, Hydraulic Tailstock, 8” 3-Jaw Power Chuck, 5C Collet Nose, Coolant. RPM, Hydraulic Tailstock, 6 ½” 3-Jaw Power Chuck, 5C Collet Nose, Coolant. Turret, Tailstock, 8” 3-Jaw Power Chuck, 5C Collet Nose, S16 Collet Pad Nose, Coolant. Chuck, S20 Collet Pad Nose, Coolant. RPM, Chrome Ways, 9” x 42” Table. 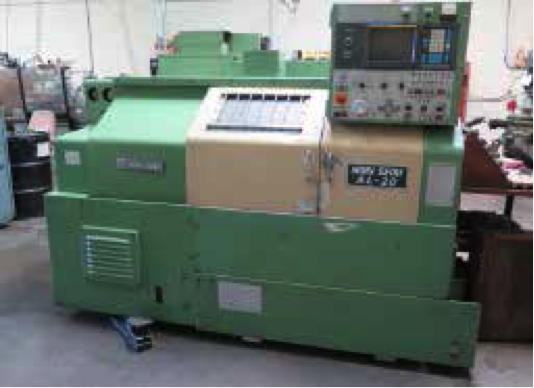 Bridgeport Vertical Mill s/n 171319 w/ 1.5Hp Motor, 60-4200 Dial Change RPM, 9” x 42” Table. RPM, 40-Taper Spindle, Power Feed, 9” x 48” Table. W.F. Wells mdl. W-9 9” Horizontal Band Saw s/n 421W721719. Rockwell 4-Head GangDrill Press w/ mdl. 15-665 Drill Heads, 23” x 54” Table. Walker Turner Pedestal Drill Press w/ Telco Tapping Head. Boyar Schultz “Six Twelve Deluxe” 6” x 12” Surface Grinder s/ Walker Magnetic Chuck. Leonard “Grind-R-Lap” Carbide Tool Lapper. Baldor and Dayton 8” Pedestal Grinders. Baldor and Palmgren Bench Grinders. Ingersoll Rand mdl. T30 5Hp Horizontal Air Compressor w/ 2-Stage Pump, 60 Gallon Tank. (6) Kurt 6”, 5” and 4” Angle-Lock and 4” Double-Lock Vises. Harig Grind-All No. 1 Precision Grinding Fixture. (25) CAT-40 Taper and (30) NTMB-40 Taper Tooling. (450) 5C Collets, Step Chucks and Expanding Mandrels. (75) R8 Tooling and Collets. Northfield 6” 3-Jaw and 4” 3-Jaw Pneumatic Chucks. (4) 5C Indexing Heads.Criterion Boring Heads and Tapmatic Tapping Head. 8” x 15” and 8” x 10” Compound Angle Plates and Angle Plates. Insert Mills, Turning and Boring Tooling and Carbide nserts. Taper and Reduced Shank Drills, Drills, Taps, Reamers and End Mills. Thread Ring and Plug Gages, Microflat 48” x 60” x 6” Grade “A” Granite Surface Plate w/ Stand.